//PICTURED ABOVE: A Lower School student relaxes on one of the new additions to the Lower School playground. This playground feature is just one of the many new structures on the recently-constructed playground. At 11:45 a.m., Lower Schoolers swarm out of their classrooms, rushing towards the newly-built playground. Children line up to get on the newly added zip-line to race each other, while the older students turn the rotating, circular structure for pre-kindergarten and kindergarten. Although they this may simply look like a playground, these structures are carefully designed for the children’s development. 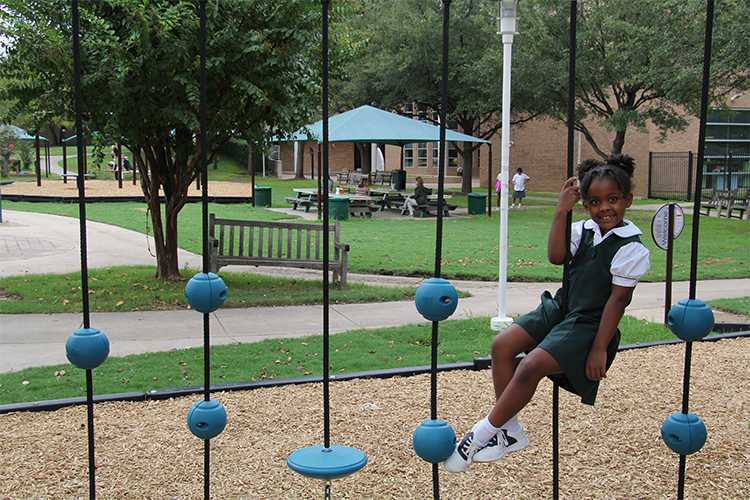 This school year, the Hockaday Lower School welcomed their newest addition: the playground. Demolition of the old playground started during the first week of July 2018, and the final touches on the new playground will be completed by the middle of October 2018. The previous playground was in place for 18 years. Natural wear and tear exhausted it, and it needed repairs. The Lower School students needed change as well. Children, eventually tired of the same structures, began to venture onto the fields rather than continue using the structures. Fourth grader Lauren Haas believes that there were limited structures for the girls to play on. “The old one was much smaller. A lot of third and fourth graders ended up abandoning the playground to go to the field. Also, a lot of people fought over the swings, and they were getting tired of this,” Haas said. Randal Rhodus ’97, Head of Lower School, and J.T. Coats, Chief Financial Officer, first started the research to repair the playground. After researching, however, Rhodus realized that building a new playground was actually more financially efficient than repairing the old one. Rhodus decided to establish a Lower School Playground Committee with Coats. The committee consisted of people who held different perspectives throughout the Lower School, such as Eric Inboden, Lower School Spanish teacher, and Valerie Hatter, Lower School Business Coordinator who also supervises recess. In December, the committee began consulting with four playground companies about different construction proposals. After tedious meetings with companies, the Lower School Playground Committee found a company that was right for them, Landscape Structures. The Lower School playground committee specifically chose this company because of its design options and its knowledge of child development. The company valued the School’s input and wanted to tailor the playground to match the School’s vision. “It was really important to build a playground that our students wanted, not what the adults wanted, because our students are the ones who will be playing on the playground all the time,” Rhodus said. The company discussed with students and faculty what their ideal playground included, and their thoughts on improvements. Landscape Structures then brought many prototypes according to their research, and the final design was selected by the students. All Lower School students voted for their favorite playground designs that were displayed in the Hoffman Commons. Each student had a chance to voice her opinion about an important decision for the school, using stickers to mark her favorites. Anticipation was at an all time high when the students returned to school in the fall. The construction was delayed for a week, so the girls had to watch it being built. Rhodus, however, saw a positive side in waiting. “The few extra days of waiting for our new playground to be ready were really excit[ing] for the girls. When [the girls] finally got to play on the playground on [August 28], they were overjoyed,” Rhodus said. “To hear their voices saying ‘this is the best playground ever,’ was so gratifying because we built a playground that they love,” Rhodus said. Rather than being separated into two zones, the new structure is joined as one, accommodating all ages. Although some structures are geared for specific ages, the playground overall has something for all ages. Junior Sabrina Fearon was surprised that even a teenager like herself could use and enjoy the playground. “It was cool that it works for us, too, the older girls, and it could be used for all ages,” Fearon said, pointing out the inclusive design of the playground. Rhodus believes that having this playground is crucial to aid in students’ unstructured play, meaning that children are not bounded by specific rules during play. This type of play helps them to strengthen their physical, social and cognitive development. For example, a child must use their upper body strength to climb a wall. They may be initially challenged by the amount of effort to climb up the wall, but after many trials, they accomplish the goal by successfully reaching the top. They not only develop their upper body muscles, but also a belief that they are capable of surpassing seemingly insurmountable obstacles. This is also true in other aspects, such as emotional or mental. “[In unstructured play,] students use their imaginations to grow their brain in a way that allows them to develop socially and emotionally, but also pull out pieces of mind they would not normally use or don’t have,” Inboden said. Both Inboden and Rhodus agreed that these skills that they learned in playgrounds will carry on until they reach adulthood. Social skills and creative thinking that are established when playing will be important skills that will be used frequently throughout the rest of their lives. Inboden already noticed the effects of unstructured play among students. At the beginning of the year, the students used the zip lines as they were. After couple of days, they developed a method of structured play that included coming up with original guidelines for racing each other. “When a student is creative [on a playground], you can translate that in to learning. When student is never given an opportunity, they aren’t able to explore their thoughts creatively,” Inboden said. Rhodus welcomes students of all ages to the Lower School playground. She hopes that the “playground reminds them how fun it is to play,” and that they enjoy it as much as she does. “I hope it is a common place for people in the Hockaday community to gather and will be a bridge between divisions. We welcome Middle and Upper Schoolers down to Lower School to play,” Rhodus said.